We Filipinos have an unquestionably strong appetite for sweet food. 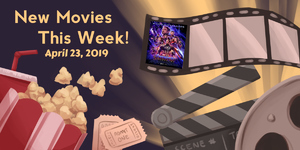 Our inclination to favoring everything and anything saccharine is made evident by our love of the home-style sweet pinoy-style spaghetti and our all-time favorite sugar-based desserts like halo- halo and leche flan. 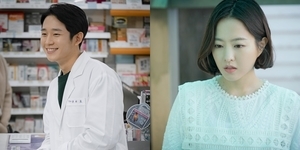 As someone who has an irrefutable liking in eating sweet dishes and desserts, there is no question that if I were to choose between yogurt and ice cream, I would pick the latter. But after tasting The White Hat yogurt, I may now have to think a little harder as to what to prefer. 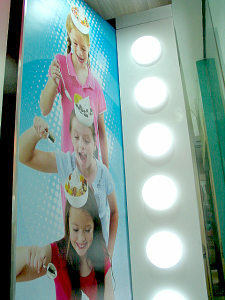 With sky blue walls accented by magenta lights, ceiling to floor picture of smiling kids, and a queue of people on its doorstep, The White Hat from afar can easily be mistaken as an ice cream joint. The White Hat however can not give you your favorite scoops in a cone. But there is no reason to ditch it -- it could still give you the creamy satisfaction you're craving for, only with a little twist: by serving yogurts, not ice creams. 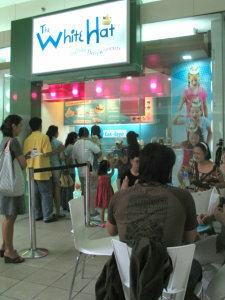 The White Hat at the 2nd floor of SM Mall of Asia is one of the more recent additions to the fro-yo (frozen yogurt) brands mushrooming up the metro. I've had my first taste of The White Hat when I was invited to cover White Hat's Celebrity for Charity Cause last August and since then I found myself frequenting the place, trying on novel and daring concoctions every visit. A regular cup of The White Hat yogurt (4 oz.) costs P85 while a large one (6 oz.) costs P115. The plain yogurt is already entirely enjoyable by itself, but you could always customize and add on something to make it more interesting, and of course, more satisfying. 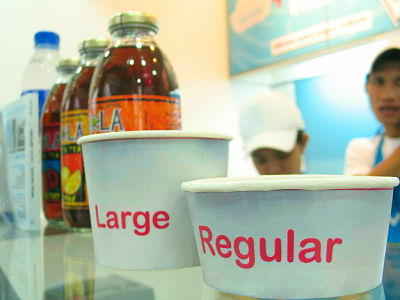 Add P20 for one topping, P35 for two, and P45 for three. Choosing toppings for my own White Hat proved to be difficult at first with the over twenty-one options available. 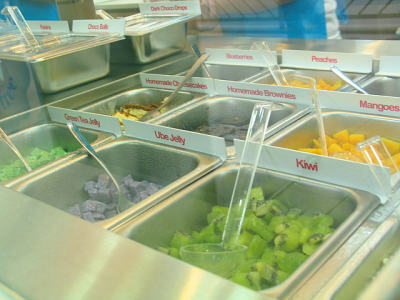 Unlike in the other fro-yo stalls I have sampled before, their choices for toppings is more extensive and not to mention, more innovative. They have fruits (served fresh!) like kiwi, cranberries, muskmelon, mandarin oranges, raspberries and peaches, to name a few. 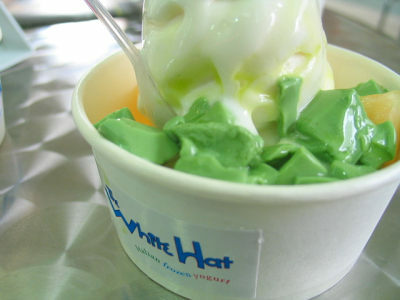 Sitting perfectly right in the middle of sweetness and sourness, The White Hat yogurt is especially customized to please the taste buds of Filipinos. 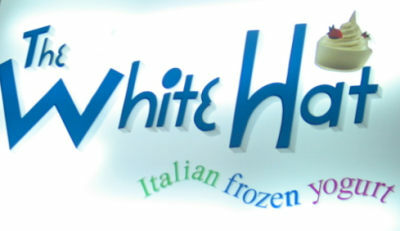 Marketing Manager of The White Hat, Eric Chao shares to ClickTheCity.com the wonders of this frozen yogurt. Adding these onto your already healthy cup of yogurt will further boost the nutrition content you'd get from eating it. If you're not into fruits, maybe their almonds, walnuts, pili nuts, Oreos, cereals, fruity pebbles, choco drops, marshmallows or sprinkles will impress your taste buds. 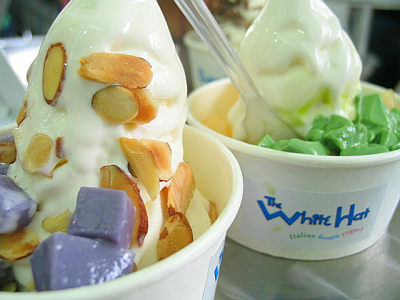 I personally recommend the ube jelly with almonds, the homemade granola and cheesecake, and the green tea jelly with muskmelons as these are my top three White Hat combinations among all that I've sampled. Aside from the extensive choice of toppings, what appealed to me with this particular fro-yo is the satisfaction I get even by eating pure, without any topping added. After all, the taste of the yogurt itself is what matters most. Looking like an ice cream, it also has the consistency and creaminess of its sweeter counterpart. 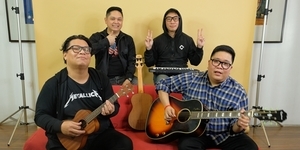 The taste, which is especially customized to please the taste buds of Filipinos, still has that tanginess of a soft serve yogurt, yet is blended with a little bit of sweetness into it. It is not that sweet, though, for you to forget that you're eating yogurt. For me, it sits perfectly balanced right in the middle. 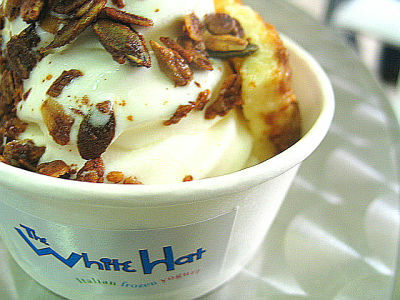 I personally am not a fan of yogurt, yet I like The White Hat's version of yogurt. This is why I highly recommend this to those who aren't accustomed to eating yogurt, but nevertheless would like to get the health benefits from it. 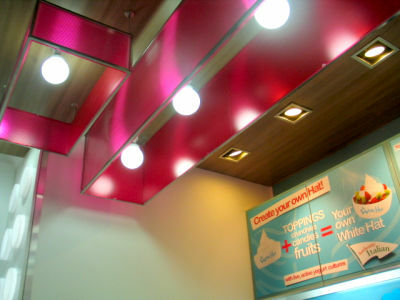 Customers will pay premium for a White Hat yogurt -- to pay over a hundred Pesos for 4 ounces of yogurt is really notably higher, compared to the other fro-yo brands available. The willingness to shell out more than a hundred for this healthy treat can be argued, but personally, considering the health benefits I could get from this, it doesn't hurt to pay a little extra.